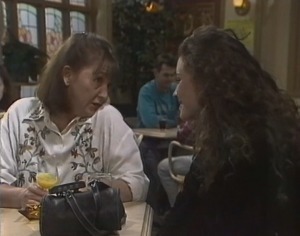 Helen telling Gaby that she's been thinking of handing the artist tours project over to Rosemary. Vikram telling Julie that he's been trying to save money to bring his sister over to Australia. Mark telling Annalise that he wants them to have a baby. As Helen lays the table, she asks how the centenary art display was. Julie tells her that there was quite a lot of talent on display. Philip adds that there were some good sales, too; one went for a very tidy sum. JULIE (smiles): Oh, someone not a million miles from home! HELEN (looking astonished): My portrait of Dave was *sold*? PHILIP (handing over a cheque): For $450! Helen gasps that that's marvellous! She adds that she's hoping to paint Gaby next. Julie remarks in surprise that Gaby's so pregnant. Helen retorts that she thinks there's nothing more beautiful in the world. Debbie joins them and asks when Rosemary's due to arrive. Helen, however, tells her that her ‘plane isn't expected until tomorrow afternoon. 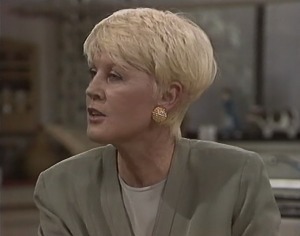 PHILIP (to Debbie): There'll be plenty of opportunities for you to say hello to Rosemary. Right now, you've got to put all your energy into getting well. DAVE: Think the bad-karma fairies paid someone a visit again...! He asks what the problem is. Mark snaps that it's him and Annalise. He explains about telling Annalise he wanted to have a baby. MARK: I've never seen her run so fast. Haven't been able to get her out of the room all night; she won't even discuss it with me. MARK: What about the big ‘p' for ‘privacy'? *That'd* sure help. I mean how are we supposed to communicate or compromise in this house, huh? If it's not Rick flitting in like a yoyo on legs, it's you chanting away with your burning oils and incense all over the place. MARK (yells): My name's *Mark*. HANNAH: No there won't – it's a special one for the holidays; and you said I could start ballet. Julie gives in and tells her to get her gear. Hannah dashes off to her room, almost crushing Debbie, who's just emerging from her room, in the process! Debbie joins the others and gives Helen a hug. She asks her to say hello to Rosemary for her. Julie calls to Hannah to hurry up. Hannah runs back out of her room and goes and opens the front door – to find Rosemary standing on the step! Helen, looking delighted, walks over and gives her daughter a hug! JULIE: I really appreciate the effort you've put in here, Vikram: you're a good worker. VIKRAM: I'm glad you think that, Mrs. Martin – because it makes it easier for me to ask you a favour. VIKRAM: As you know, my sister's arriving from India in a couple of days and my current standard of accommodation is, shall we say, not suitable for a young lady. JULIE: Oh, do you want me to help you find a flat? VIKRAM: Oh no – that part of the problem is solved: I've found a small flat not far from here; but I spent most of my savings on my sister's ‘plane fare and I have no money left for a bond or even the most essential pieces of furniture. Julie stands there looking uncertain. VIKRAM: I'm an honest man, Mrs. Martin. I would not disappoint you. JULIE: No, no I'm sure you wouldn't. Vikram, please don't take this personally – it's nothing against you – but going guarantor on a loan is something I'd only consider for close family. Vikram nods that he understands. There's an air of awkwardness between them, though. Rosemary is sitting at the kitchen table as Helen makes some tea, commenting that it hasn't *all* been gloom and doom after what she'd heard about Michael and Debbie... Helen smiles that the place wouldn't feel the same without *some* sort of crisis to attend to! ROSEMARY: I'm glad to hear you say that, mummy, because I'm going to hit you with another one. HELEN (sitting down): Oh? What? ROSEMARY: Well it seems like I've been pushed out of my own business. HELEN (gasps): How could anyone possibly do that? ROSEMARY: Let's just say I was the classic victim of some very heavy corporate manoeuvring. HELEN: Darling, that's terrible. You worked so hard to get that business where it is. You must feel absolutely cheated. Rosemary admits that she did feel very bitter, but then she realised that she'd done it once so she can do it again – so she's come home to search out possible business ventures. HELEN: Have you given much more thought to my Outback tours? ROSEMARY: As a matter of fact I have, yes. ROSEMARY: It's a very exciting concept, mum. I'll have to look more deeply into it, yes, but at this stage I'd say it could be a goer. A broad smile crosses Helen's face! Dave is peeling beans when Mark walks in and apologises for flying off the handle last night. Dave, however, tells him that he's right: he and Annalise probably *do* need some extra space right now. He suggests that he should pack his swag and go. Mark, however, insists that the problem is with him and Annalise, not with Dave or Rick. Dave asks if *he* should have a go talking to Annalise. MARK (glumly): Sure. Be my guest. I wish you luck. DAVE: Luck's got nothing to do with it! Just use a bit of the old Gottlieb charm! 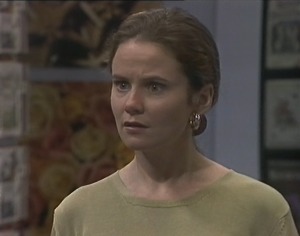 DAVE: Her make-up kit, jewellery, schoolbooks, the lot: it's all gone. Helen and Rosemary are sitting at a table, having lunch. Helen is telling Rosemary that the Outback tour will be just like your average package tour, but instead of tourists, the visitors will be artists. Rosemary suggests that they should widen the tours to more than just professional artists – such as school groups. She then asks if *Gaby* wasn't working on the project. HELEN: Um, yes... but we didn't actually see eye-to-eye on the creative side. ROSEMARY: That's OK. I'm more interested in what she's got to say about it from a business and financial point of view. HELEN: She wasn't exactly thrilled when I took her off the project. ROSEMARY: Oh mum, if she's half the professional I heard she is, she won't have taken it personally. MARK (grimly): No, everything's *not* all right. Hannah and Miranda are kneeling on the lounge room floor, playing draughts on a board on the coffee table. Hannah wins the game and Miranda asks wearily if there's anything else they can do – such as making pikelets. HANNAH: There's no adults here. MIRANDA: I've made pikelets hundreds of times at *my* house. HANNAH: Me too – but not by myself. MIRANDA: It'll be a surprise for them. We'll clean up after ourselves. Come on, Hannah, don't be a spoilsport. The two of them dash off to the kitchen. GABY: Let me get this straight: you and Helen want to paint *me*: two stone overweight and 8½ months pregnant? GABY: Why would I want a permanent reminder of how I look and feel right now? PAM: Because it's a celebration of the female form and all its miracles! I mean, life is practically leaping out of you! GABY: OK, OK – so long as it's tasteful! Pam dashes off to go and tell Helen. As she does so, she bumps into Rosemary and comments that it's long time no see! Rosemary asks her if she thinks Gaby will mind talking business for a few minutes. Pam smiles that it can't do any harm. She heads off and Rosemary sits down with Gaby. GABY: Yeah, it's not as though you can miss me, hey! 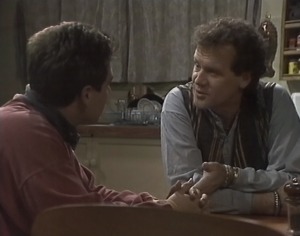 What brings you back to Erinsborough? ROSEMARY: Same old things: family... friends... business... In fact, it's the business side of things that I'd like to discuss with you at the moment. GABY: Sure – what's on your mind? 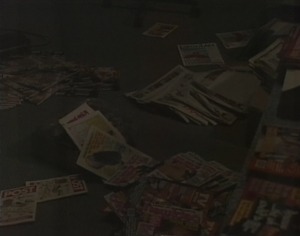 Vikram is stacking magazines. Julie tells him that she's heading off to the bank. She picks up a bag of money and goes to head out. As she does so, though, the lights go out and the newsagency is plunged into darkness. 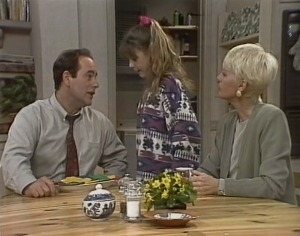 JULIE (snaps): Oh great – what's happened now? JUILE: I can see *that* - but it's about *all* I can see. The two of them start moving around, but end up knocking things over and bumping into each other! Julie eventually makes her way back behind the counter and finds some candles and matches. She lights one and the two of them look around. They've managed to leave stock strewn all over the floor! Gaby opens the door to find Mark on the step. She starts enthusing about her business chat with Rosemary. Mark listens before muttering that he won't bore her with business, but he *could* send her to sleep with his personal problems. Gaby invites him to sit down as she guesses that he's had another fight with Annalise. GABY: So how did it start this time? MARK: I kind of had this plan. No – it wasn't really a plan; it was an idea. It wasn't even that, really; it was more of a suggestion, I suppose. GABY (presses wearily): Spit it out, Mark. MARK: I kind of suggested that if Annalise and I wanted to strengthen our relationship, then... perhaps we should do it by having a baby. GABY (effectively rolling her eyes): Let me guess: she flew right off the handle. MARK: She flew right out the *door*. Gaby sighs that she doesn't want to take sides, but there are plenty of ways to sort out a rocky relationship and having a baby isn't one of them. Mark retorts that he can't help the way he feels: he really, really wants to be a father. GABY: Maybe you just overwhelmed her a little bit – and maybe she can see what *you can't*. GABY: That you need to sort out your own lives before you even consider creating another one. Hannah and Miranda are making a mess as they bake pikelets. Hannah gets some food colouring out of the cupboard and they each add some to their bowls. Holly is running around between them as they work! The agency is still lit just by candles as Julie and Vikram work to tidy up. The lights suddenly come on, though, and Julie says quickly that she'll almost get to the bank if she goes now. She heads over to the counter but stops in her tracks. JULIE: Vikram! The money – it's gone. She starts looking around everywhere. Vikram joins her. Rosemary sits down with Helen at the table. She then tells her mother that she's spent an interesting and hopefully fruitful day checking out Helen's arists' tour idea, and she can't wait to get the show on the road. ROSEMARY: It'll be good to give birth to a new enterprise, mum! HELEN: Speaking of giving birth, I'd better get over to the Willises' because Gaby may be in labour at any time and I'll miss out on my portrait! As Helen heads off, Philip arrives home. Hannah dashes over to him and throws her arms round him. PHILIP: Hello, Bu...; Hannah! How was the ballet class? HANNAH: Great! Oh – I made you a surprise! PHILIP: Oh, um, Hannah, they look yummy. HANNAH (enthusiastically): Why don't you try one? PHILIP (warily): Oh, I don't think I should; not before dinner. PHILIP: Because I can hear her scratching on your door, and that usually means she wants to be fed. HANNAH: But I fed her – I promise. PHILIP: Perhaps she just wants to be let out? He leads Holly over to the kitchen. 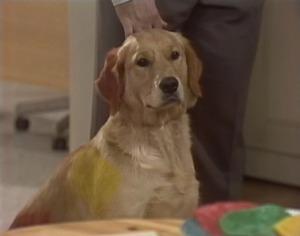 She's covered in multicoloured patches painted on with food colouring! GABY (sighs): I've waited nearly nine months for the birth. I guess I can wait a few hours for the portrait. Julie and Vikram are still hunting for the missing money. Julie mutters that Philip is going to have a heart attack when he finds out. Vikram suggests they go through all the things Julie did before the lights went out. Julie, however, assures him that she's done that. VIKRAM: It *must* have been knocked off the counter. JULIE: Then where did it land? VIKRAM: Mrs. Martin, it must be here somewhere. I really wish I could stay here and help you find it, but I'm already late for my shift at the petrol station. JULIE (cries): But you can't leave *now*. VIKRAM: Mrs. Martin, if I don't go now, my boss will sack me. I can't afford to lose the job. JULIE: You *need* the money, don't you? 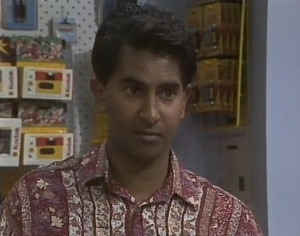 VIKRAM: Mrs. Martin, I've already told you. JULIE: I know what you've told me, but, Vikram, now I want to hear the truth. Come on, I'm not stupid: it all makes sense. You told me this morning that you were desperately in need of money, and you and I have been the only two people in the shop since the lights went out. I wouldn't steal my own money, would I, so who do you think that leaves? JULIE: Look, I understand that you were desperate, but that's no way to treat people who employ you; the people who trust you. Vikram, why don't you just give the money back now and we'll forget about the whole thing. Vikram, however, turns to leave. JULIE (demands): Where are you going? VIRKAM (coolly): Mrs. Martin, it's obvious you misjudge my character – and I've misjudged yours. I've enjoyed working for you and your husband, and now I think I'd prefer never to see you again. With that, he walks out, leaving Julie staring at him in astonishment.